Foreword from the author: This essay contains large Christmas spoilers, and may offend some people with deeply held theistic beliefs. If this is you, I recommend that you stop reading now, and if you read it anyway and are offended, then please do not complain. 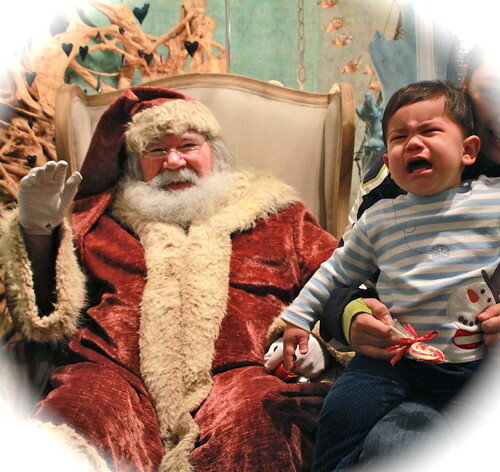 I was two months shy of ten when I learned the truth about Santa Claus. I was in fourth grade, and a year or two earlier, my voracious reading had convinced me that there was no way for it to be true. But then my best friend, told me that she had, in fact, stayed up until midnight the last Christmas Eve and seen him with her very own eyes put the presents under their tree. It never occurred to me for a second that she was lying, and my faith was restored for another few years. My mother, to her credit, only hemmed and hawed a little before deciding that I was old enough to understand that Santa Claus lived in all our hearts, something-something about Jesus and the spirit of giving, and yes, I was still getting presents, but the most important thing was that Santa wasn’t real, but a lot of people didn’t know that. So you should never, ever talk about how he didn’t exist, because it was really mean and rude. I took that lesson to heart, and my mother was, I imagine, pretty pleased with herself. To this day, I’ve never spoiled a kid’s belief in Santa Claus. What my mother did not anticipate,however, was that I took that same lesson, twisted it about in my uber-ordered autistic mind, and applied it to God. You see, to me, logically, it just made sense. I knew the basics of evolution and biology, and they didn’t square with any big-guy-in-the-sky. We didn’t go to church except the occasional Easter and certainly never Sunday School. I really had no idea why people were so into this whole God thing, but life in general was a very confusing thing to me and I just chalked it up to being another one of those mysterious social conventions I didn’t get, along with things like eye contact, small talk, and tact. As I got older, I thought maybe it had something to do with the placebo effect, and that praying made people feel good because when they prayed, they slowed down their breathing, got more oxygen into their lungs and calmed down. Just as I knew that Santa was fake, even though everyone talked about him and his picture was everywhere, I knew that God must be fake, too. When I tell this story today, people think it’s funny, and I agree. But in my mind, it all made sense and, to be honest, it still does, even though I know it’s not true. There were conspiracies in the world, huge ones, from spy rings to Santa Claus. And I had proven how smart I was by figuring out the biggest collusion of all: the whole Bible/God thing was a story, just like Rudolph the red-nosed reindeer, only a bit older and with a whole lot more wars over it. As a teenager, I grasped that people who told the truth about the whole god thing were called atheists, so I started calling myself that. In my twenties, however, I found religion, in the form of Unitarian Universalism, and it was at that church where, as an open atheist, I finally found out the truth about theism. Which is this: That people believed in Him. Like, for real. Like little kids believed in Santa Claus, only not, because these were grown people, educated people, people I respected and trusted, and they... They honestly thought that some invisible guy in the sky had something to do with everyday life? I could, on some level, understand where Christian and other religious fundamentalists came from: I figured that they must be stupid and not have had evolution explained to them properly. Simple. I mean, these were the same people who thought that Jesus was a tall white guy with blonde hair, instead historical Jesus I thought probably did exist who had short, brown-skinned dude with dark hair. However, to this day, it remains a puzzlement to me how people can say with such absolute certainty that God exists and not Santa Claus. Well, people say, the parents put gifts under the tree. That’s a fact. And I like facts a lot. Give me a scholarly-reviewed article in an academic journal, preferably with several double-blind studies to back it up, proving the existence of god, and I’ll be just as happy as the rest of you. Until then, I’ll continue to go to church and sing the hymns and know that my religion, and my soul, are fine without any deities, just as I was fine without Santa Claus. Note: My belief system is actually much more complicated than plain old atheist, as are most people’s, but I couldn’t go into it without derailing the piece completely. Suffice it to say, I am very happy with my beliefs and I hope you are happy with yours, and please don’t try to convince me otherwise. If you are a theistic Christian family, great. I just don’t recommend bringing Jesus or God into the Santa Claus talk. And I do recommend, highly, having a Santa Claus talk with any kid over ten who hasn’t figured it out yet. Autistics, as a whole, can be very naïve, and I was very shocked that my mother had lied to me when I never lied myself, so it’s better to get the whole thing over with and give them time to forgive you before they move out of the house. Not to mention the whole teasing and age-appropriateness thing. We are also very trusting, and if a teenager, especially a female one, still believes in Santa, she might get herself into a risky situation around the holidays or with people in costumes. Lastly, if your kid knows the truth and forgets that he’s supposed to not tell, and ruins it for another kid or the class—the other kids will get over it. Don’t let your favorite autistic beat themselves up over it, because they’ll think they ruined Christmas for that person forever. They haven’t. Kids are tough, and we all need to learn the truth sometime.